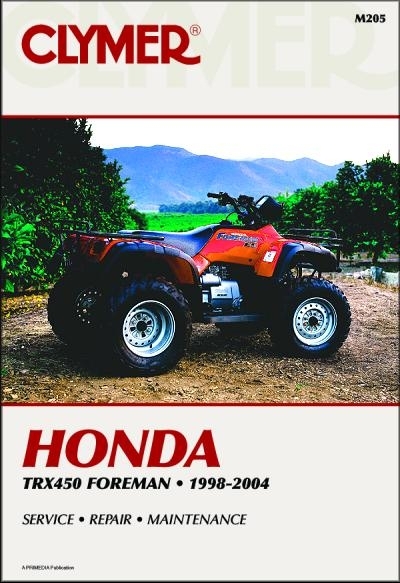 Honda TRX450 Foreman Repair Manual 1998-2004 is available for only $26.95 from TheMotorBookstore.com. Largest selection of Clymer, Chilton, Haynes, Bentley and Seloc repair manuals at discount prices. This Honda ATV Repair Manual covers the following ATV models and years. Remember to take your Honda ATV repair manual when you ride. It will easily fit in your gearbag, toolbox, or glove box. Having all this great info, and not having it when you ride is kinda silly. We have all had at least one ride that was a waste because somebody broke early in the day, and couldn't enjoy the trip. But really now, a Honda ATV repair manual is cheap insurance against the dreaded Ride Day Demons, that show up unexpectedly. Not the Honda ATV Repair Manual you need?